Koltyn is a little milking machine! She has a beautiful topline, lovely udder, supple dairy skin, and is a precious girl. Her sire was named the 2017 ADGA PREMIER SIRE and Koltyn herself placed 7th in the intermediate kid division at the 2016 ADGA National Show. Glory (aka Glory Bell) is one of our favorite does on the farm. She has wonderful length of body, a beautiful top line, brisket and depth of body. Her udder is icing on the cake- fantastic attachments, proper teat placement, supple dairy skin. With each freshening her capacity improves! Glory has her restricted leg and placed 5th in the Nigerian Dwarf Intermediate Kid division at the 2016 ADGA National Show. She is also the great granddaughter of Wood Bridge Farm Belladonna, 2014 and 2016 ADGA National Champion. Peco is a 2 year old first freshener who packs some amazing genetics! She is a lovely uphill doe with nice width in the front and back. Her first udder gives me a lot of excitement to see what it becomes with subsequent freshenings. She has soft supple dairy skin and a delightful personality! Cora is a precious girl with outstanding milk production! She is easy to milk and has the most amazing supple skin. Her genetics speak for themselves...her grandfather is the 2017 ADGA Premiere Sire. Dolly is a character. She is also known as Nibbles because she has to put her lips around everything she sees. While we don't show Dolly as we bought her as a "genetic package" after she suffered some udder scarring from a case of mastitis, she is easily my second favorite doe on the farm! She actually has a beautifully attached udder, and her body confirmation is beautiful. She has a beautiful tipline, depth of body, and is just overall a nice doe to look at! Dolly placed 10th in the 2016 ADGA National Show in the Senior Yearling class. Calypso was one of the first goats born on our farm. 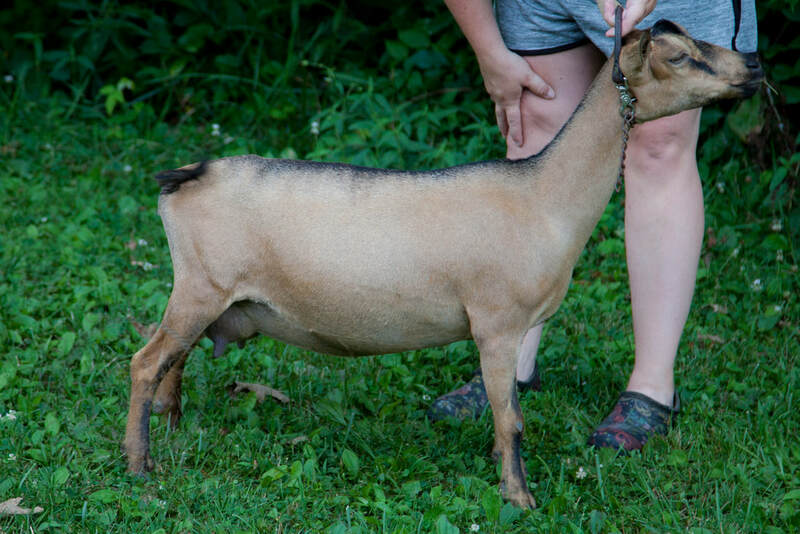 She is on the smaller side for Nubians but she is a milk machine! She effortlessly puts nearly a gallon of milk in the pail a day and is a dream to milk. We don't show our Nubians, but if you are looking for productivity, Calypso and her progeny are what you are looking for! Her lineage includes very popular herd names such as Goldthwaite, Saada, and Kastdemur's! Claire is the oldest doe on the farm and is definitely the matriarch. 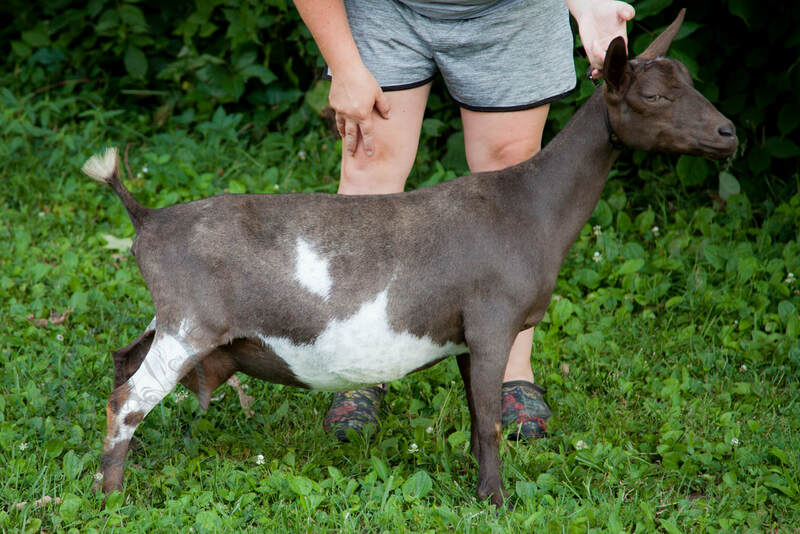 She is a super productive doe and is an incredibly easy keeper! Her parasite resistance is something to be proud of. She comes from some amazing genetics in her lineage and she herself always throws fantastic kids! She is also a wonderful mother. Lakken is a beautiful Toggenburg doe and exhibits a lot of dairy strength. This year (2018) was her first freshening and she did not disappoint. Her udder attachments are fantastic! Her capacity is great is well, but I'm really looking forward to seeing what it looks like with subsequent freshenings!